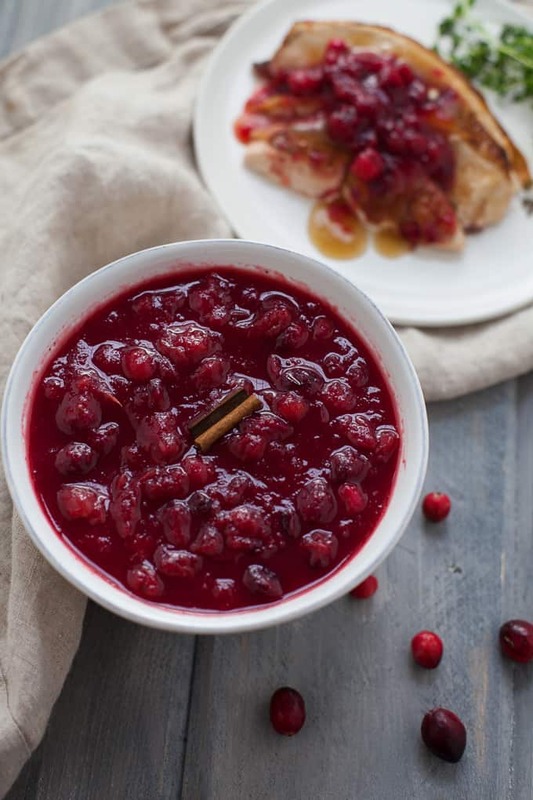 This delicious naturally sweetened cranberry sauce is sweetened using natural ingredients like applesauce and orange juice and has less added sugar than most recipes. Ok, guys. Let’s buckle up. It’s game time. What’s your game plan? Your lineup? No, no, no. Not that game. It’s time to get your plan in order for Thanksgiving! Don’t fret. 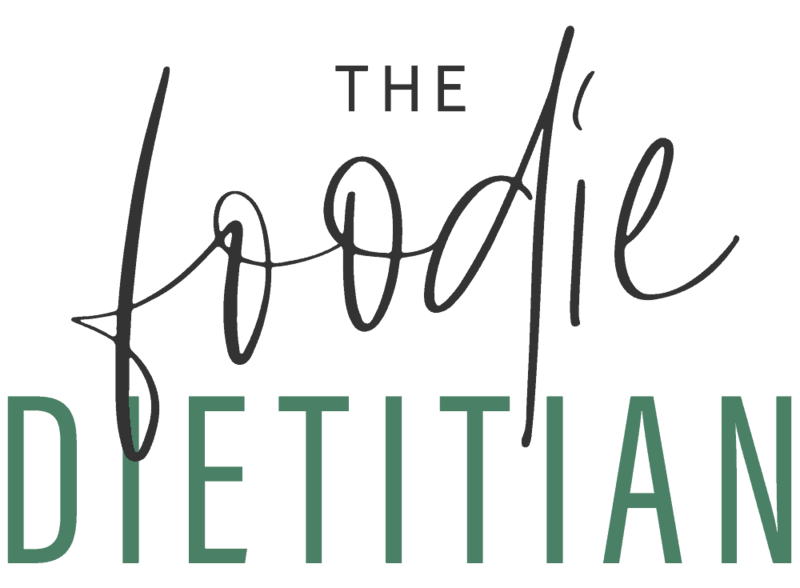 If you’re in a pickle about what to serve up, I’ll be sharing some of my fav Thanksgiving recipes with you over the next week. 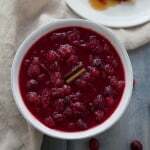 Like this naturally sweetened cranberry sauce you can learn how to make by watching my video below! One of my favorite Thanksgiving sides is homemade cranberry sauce. Which is kind of funny because I usually don’t eat turkey on Thanksgiving. But in case you were not aware, cranberry sauce is SUPERB on TOFURKEY. Everyone keeps asking me if I’m going to eat turkey this year since my recent “coming out” as a flexible eater. And I’m like chill duuuuudes. Imma do me and you do you. Yeah, I’m going to try it but I cant guarantee I’m going to like it. I may have a Field Roast’s Celebration Roast on hand just in case. Because that would be REALLY SAD if I didn’t have anything to put my cran sauce on! Although let’s be real, I eat this shiz by the spoonful. Ok so this is a cranberry sauce that has less added sugar than most recipes. About 2/3 less. But I make up for the sweetness with ingredients like applesauce and orange juice. But here’s the deal. I’m not one of those anti-sugar, sugar is the devil people. Sugar, or glucose, is our brain’s primary source of fuel! So, please, please don’t feel guilt or shame around your cran sauce this Thanksgiving or ANY Thanksgiving dish for that matter. Enjoy your freaking holiday that comes ONCE A YEAR! I love this recipe because you get the bright citrus from the orange juice and the warming spices from the cinnamon, allspice and nutmeg. I’ve been enjoying the leftover cranberry sauce stirred into my morning oatmeal with some nuts and seeds! YUM. Add cranberries, applesauce, orange juice and agave to a medium saucepan. Bring to a boil over medium heat. Reduce to simmer and add cinnamon, allspice and nutmeg. Let simmer for approximately 10-12 minutes or until most of the cranberries have burst. Are you ready for game day? Will cranberry sauce be on the menu? This post was originally published November 2014 and has recently been updated to give you better and more beautiful content! 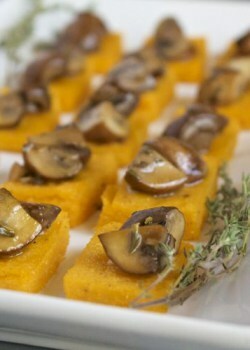 Check out my recipes below for more Thanksgiving ideas! Such a cranberry sauce fan! We grew up eating the canned stuff so I love making my own now too – the orange flavor here is perfect! Yessss, same! Homemade is so much tastier! 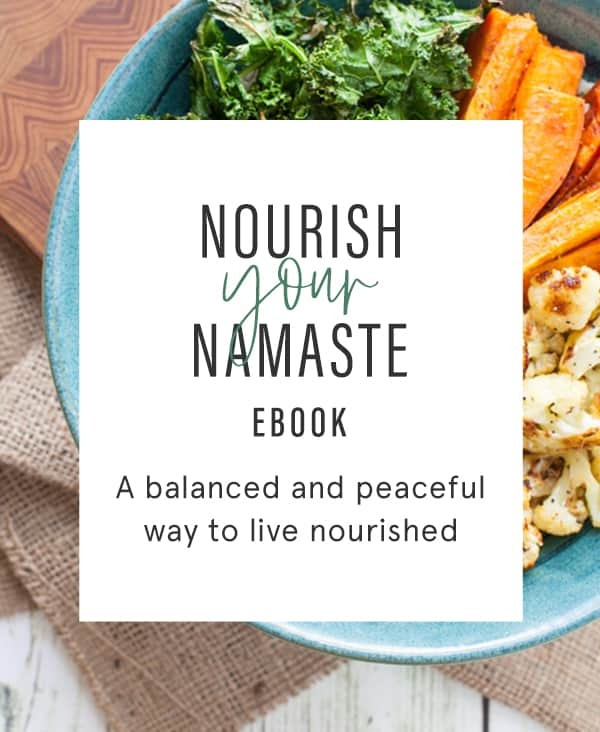 This sounds so yummy and love the flavors! I think you might like turkey! Depends on how it is cooked that can make all the difference. Enjoy your holiday Kara! Thanks, Gabriella! It was OK. Better slathered in gravy and cranberry sauce, IMO ;). Hope you had a nice Thanksgiving! 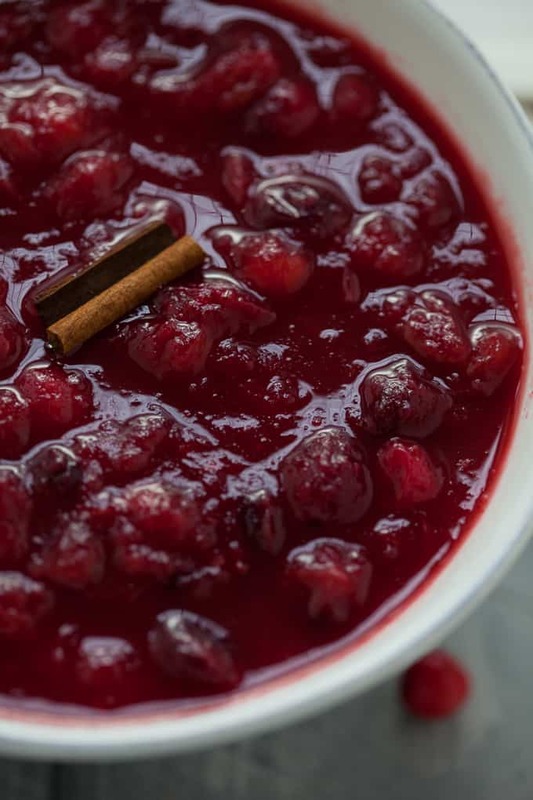 I was so looking for a cranberry sauce recipe and this one looks like I hit the jackpot! Thank you for sharing! Awesome – hope you enjoyed it, Tommy! I’ve been experimenting with ways to sweeten my cranberry sauce with less added sugars. This looks like a great option to try. Can you suggest a substitute for the agave syrup if I can’t find it? Does the cranberry sauce need to be refrigerated after it’s done or can I take in on a 3 hour plane trip to Florida?! You can try honey instead of agave syrup. Yes, the cranberry sauce should be refrigerated after it’s done. This will help it to cool and thicken. What a great idea to add applesauce! I bet it adds to the creamy texture as well! It’s the Field Roast Celebration Loaf – SO yum! Thanks, lady! I LOVE making my own cranberry sauce so that I can control the sugar content 🙂 Love how you used orange juice to do it, I’ve used that in other recipes of mine too! Thanks, Sarah-Grace! Yeah, I can’t do canned cranberry sauce anymore. Homemade is SO much tastier! I would love to try this but I do not have agave…is honey a good alternative? or maple syrup? Also… no orange juice…but I do have oranges… wonder how many I’d need!! Hi Vanessa, I’m sure honey or maple syrup would work just fine as a substitute. You’d probably need about 3 oranges to yield 1 cup of orange juice. Enjoy! I LOVE field roast thanksgiving loaf! It’s the best! I have no shame in my game and buy a few each holiday season. Leftovers are awesome thinly sliced and stacked like a sandwich! Of course, you know my feelings about cranberry sauce. I top everything with the stuff! YUM! Right?! Love that Field Roast loaf too! Mmmm stacked as a sandwich sounds wonderful too. Best be trying that this year :). Thanks, Elizabeth! Cranberry salsa sounds pretty fantastic too. I’ll have to check it out! Glad you like the recipe, Nancy!! I’m with you – I would be down to eat homemade cranberry sauce all year round! 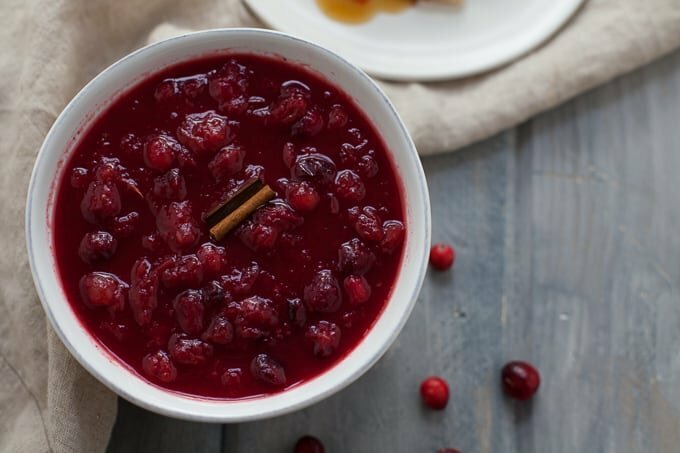 I love cranberry sauce and a few years ago I made a similar version with orange juice, but mine still had a good amount of sugar (3/4 cup to 12 oz cranberries to be exact). Love the addition of applesauce here! Did you use an unsweetened variety? Jessica, it was an unsweetened applesauce that I used (I should specify that! – thank you!). YUM! 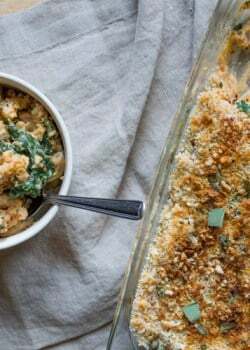 I’m going to make a point to bring some new favorite healthy dishes to our Thanksgiving this year so I can’t wait to see what you are up to in your kitchen… while I love my mom’s traditional sides, and I definitely don’t over eat (I’ve never understood why binging is the thing to do for Thanksgiving? ), I don’t always feel the best because the food is heavy. 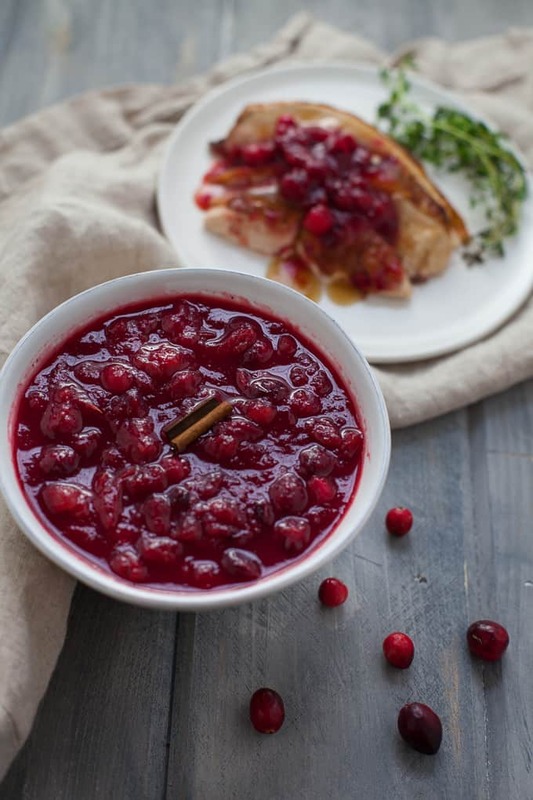 I’d love to introduce a cranberry sauce like this and maybe a big green fall salad! Kristina, I’m so with you. Never understood the binging on holidays. It’s not like people don’t eat the other 364 days of the year! It’s much easier than you think, Andrew! It only took me 1-2 mins prep and 10-15 minutes to cook on the stovetop. You just throw all the ingredients in a pot and let it simmer! I’ll definitely keep my eyes open though for some cool artisan purveyors of cranberry sauce and let you know if I spot any! YUM! 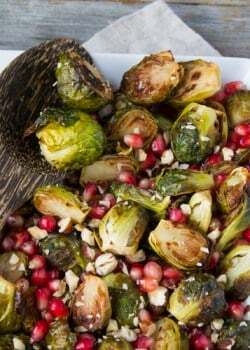 I am so excited to host Thanksgiving at my house this year and can’t wait to make this sauce! Yay!! Thanks, Dianna! 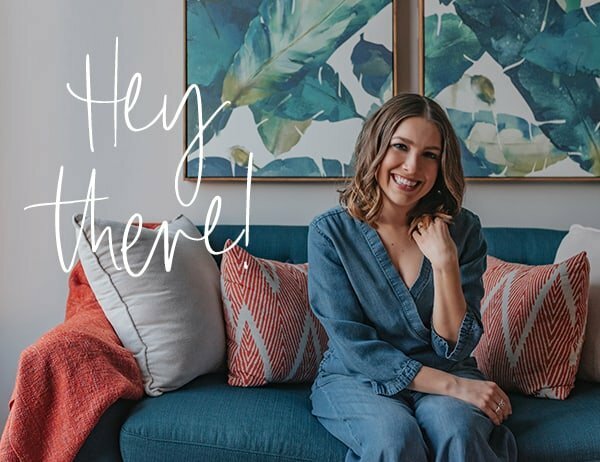 Can’t wait to hear what you and your guests think! The one time I made cranberry sauce…it was a fail. WAY to sour, haha! I need to try it again though! Homemade is the only way to go! Totally agree. Homemade or no cran sauce for me. I really liked the ration of tangy to sweet in this recipe. Hope it’s better for you the second time around!